A powerful typhoon blew through western Japan on Tuesday, causing heavy rain to flood the region's main offshore international airport and high winds to blow a tanker into a connecting bridge, disrupting land and air travel. The storm was heading north across a swath of Japan's main island of Honshu toward the Sea of Japan. 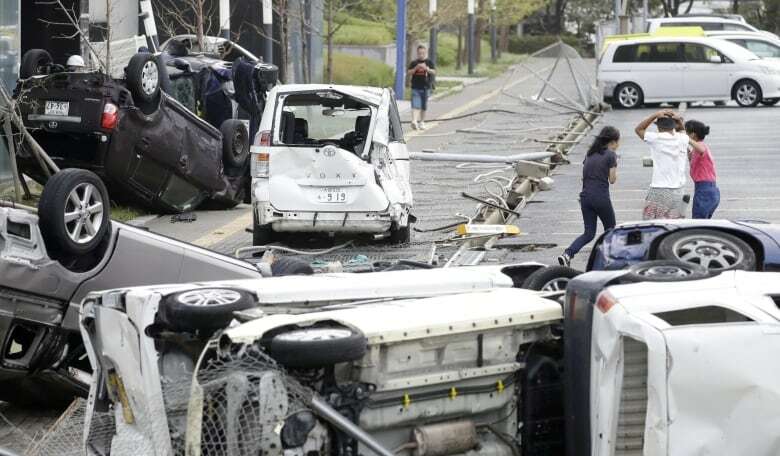 It was off the northern coast of Fukui on Tuesday evening with sustained winds of 126 km/h and gusts up to 180 km/h, the Japan Meteorological Agency said. A 2,350-tonne tanker that was mooring slammed into the side of a bridge connecting the airport to the mainland, damaging part of the bridge and the vessel. The tanker's 11 crew members were not injured and remained on board, according to a regional branch of Japan's Coast Guard. More than 700 flights have been cancelled, according to Japanese media tallies. High-speed bullet train service was suspended from Tokyo west to Hiroshima.